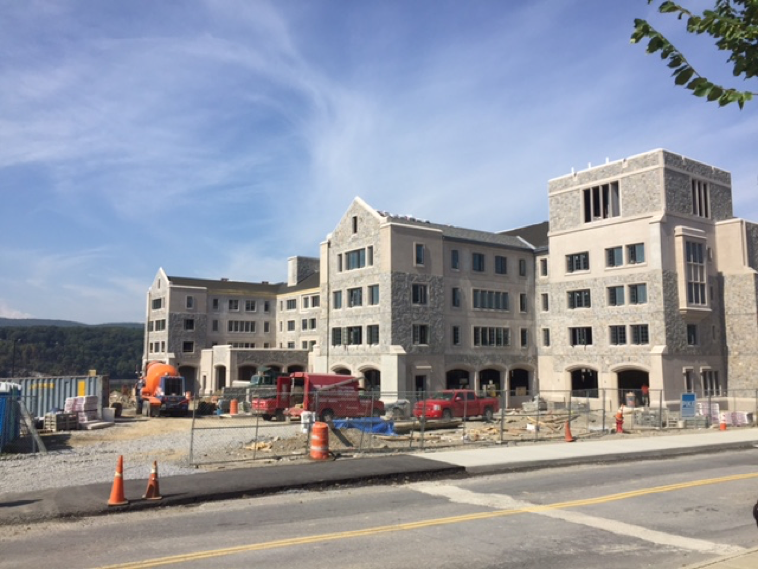 Students at Marist College have had to cope with the school’s failure to complete construction of the fourth New Gartland housing structure. “I got an email from Marist saying one of the subcontractors broke something and set the construction back,” said Victoria Conlin, a junior from Connecticut. Conlin, along with many other students at Marist, was originally scheduled to live in Building D, the newest addition to New Gartland. These students were notified by email that their original housing assignment would not be fulfilled. At Marist, on-campus housing is determined by a system that incorporates grade point average, club activity and conduct scores. This system, called priority points, has created an ultra-competitive housing situation for students. The new buildings are normally the most sought after housing options. “Since New Gartland was the newest housing it was pretty competitive to get into,” said Anastasia Ricci, another junior from Connecticut. Ricci’s housing group had an above average number of priority points, which enabled them to sign up for the new building on housing day, one of the most hectic days of the year for a Marist student. “It was annoying that we had to deal with housing day, only to have it be changed at the last minutes,” Ricci said. Students that chose New Gartland Building D as their housing were assigned to Fox Run, an apartment complex that is slightly off-campus. In past years, excess students were sent to the further, secluded Residence Inn Hotel rather than the apartments at Fox Run. The move to Fox Run for students is effecting students in more ways than one. “Fox Run is more expensive, but Building D residents were reimbursed $2,000 for the inconvenience,” Ricci stated. Overall, both Conlin and Ricci are content with their housing situation at Fox Run. They were both initially frustrated but have now taken a different view on the situation. Ellen Rathe, while still feeling positive, has been a little less hesitant to completely changing her mind. “I like the fact that we have a lot of space here [in Fox Run]. I feel like I’m in an apartment,” she said. She also discussed the forgotten benefits of having her own bathroom and not having to share it. “[But] there have been some issues occurring with the gates, but mostly I miss being in the center of campus like I was Lower New,” Rathe said. Rathe was preparing to live toward the middle of campus this semester but, like the others, has had to adjust. These students haven’t had much of a choice other than to do exactly what the school says. There may be a few students that regret signing up for the new building, but others have grown to enjoy Fox Run. “I get that things happen and it doesn’t always go as planned but you just go with the flow, I guess,” Conlin said, summarizing her experience. This entry was posted in On Campus, Uncategorized and tagged Construcction, housing, New Gartland. Bookmark the permalink.